Still shooting bows in all weathers. Glad the first and second years of SURA are over. February 2011 starts our 3rd year and thankfully (touch wood) my health is improving. 2011 should prove interesting with 10 acres of wood land to play in. SURA is now defintley a force that counts. I am no longer learning to play Tiddley winks I am good at it. I am however stil dog faced !! ahaha yeah!! i dunno why it did that i said i was male but it changed ahah think my mum is not telling me something ahha and thanks had a great day and i can defo learn a lot from the club :D! Hi Mick I would'nt play you at tiddley winks cos you always wink afor you tiddled.hope you and Mandy are well. 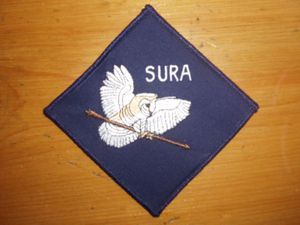 the SURA is certainly moving on well thanks to all the hard work that goes into running a set up like SURA.The unsung heros. all for now Ole Cotonian bugwhiskers. Sorry that we have to lose you and yours. As agreed on a personal note your strimmer will be returned. ASAP. On line memberships will be reduced to limited status ASAP. This will still allow you and yours to recieve updates etc. Individuals can unsubcribe from these messages. Further you and yours are still welcome to come along and shoot with us by prior arrangement. Last but not least. Your family come first. Archery is secondary. Well, I might actually do that. Got to vote a budget though, and this year is not the right one. Daughter wants to go to the university. We'll find a way. What's the best season? Sunday 2nd October, Charlies party Starts 1pm til 3 archery for the first 45min or so! at Lauder leisure centre. As I promised, my profile has been done ... At last!